This is the second post of what is intended to be a three-part series looking at various aspects of Pelikan’s nibs. The first post was a discussion of the PF and E|N hallmarked nibs. 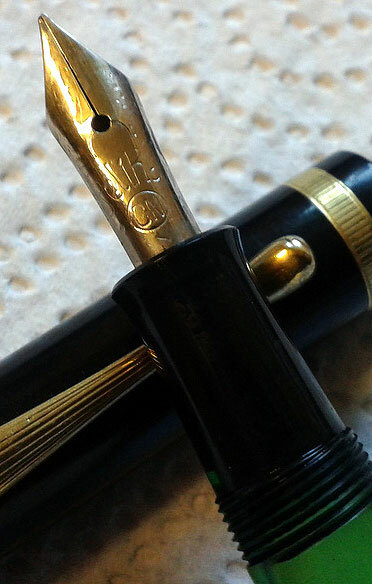 This post will explore how Pelikan’s collars, feeds, and nibs have changed over time and will also discuss compatibility across the various models. I think that these nibs are deserving of this attention because their interchangeability by the user/owner is one of the defining traits across much of Pelikan’s Souverän and Tradition lines which has always been a boon to hobbyists and collectors. Before proceeding I would like to reaffirm that I am simply an enthusiast and the information presented below is what I have gathered from my years of collecting and should in no way be taken as authoritative or exhaustive. 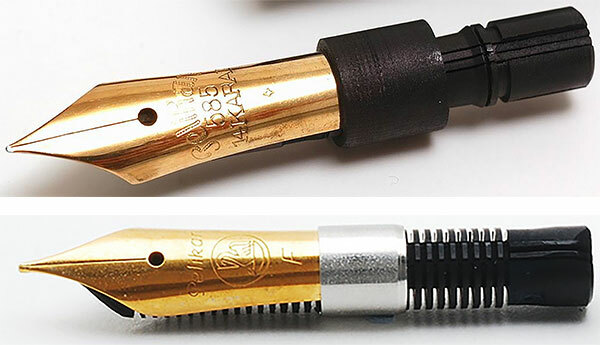 The majority of Pelikan’s nibs, going all the way back to their first release, have featured a screw-in type collar that allowed for the nib to be removed and replaced. I’m sure that this was intended to be done at the factory or by an authorized retailer but the simplicity of the design has allowed the hobbyist to swap nibs relatively easily giving one pen a chance at multiple applications. Since nib sizes have been relatively constant, nibs from one model are often compatible with another. That said, caution should be exercised when swapping nibs. Vintage nibs can be frail such that Pelikan themselves had a special tool for removing the ebonite feeds due to their fragility though these are incredibly rare and hard to come by. Also, just because the nib of a different model may fit into a section does not necessarily mean that there is enough clearance in the cap to accommodate it. The earlier screw-type collars appear to have been made of hard rubber and have historically been very durable without significant reports of failure. In 1951 when Pelikan introduced the 400, there was an experimental attempt at a friction fit feed. These collars were smooth, without threading, and fit into the section via a friction fit. It seems that Pelikan abandoned these after only a short run and it is unclear how many remain out there. Interestingly, Pelikan again attempted the friction fit experiment in the early 1980’s with the introduction of the M400. They apparently drew similar conclusions and switched back to the threaded collar after only a short time. Several examples of the M481 which followed in 1983 can also be found with friction fit feeds. In the 1950’s and 60’s when space age plastics were all the rage, Pelikan made collars from a clear plastic material known as polystyrene. These collars were brittle and have had significant failures over time in all of the models in which they were employed. In fact, a cracked or damaged collar has led many to erroneously believe that they have a friction fit feed rather than a failed collar. The tell-tale trait, however, is that all friction feeds should still have a collar (as depicted above) whereas a cracked collar will leave you with just a nib and a feed. This will be explored in more detail in the final post of this series. Thankfully Pelikan learned its lesson and today’s collars are made with metal and are incredibly durable. I would be remiss if I didn’t point out one final issue where the collar is concerned. For a time in the 1970’s, Pelikan outsourced some of their production to a company called Merz & Krell, notably the 400NN and the 120. I won’t go into the details regarding the small differences in the design of these pens (I’ll save that for a future post) but suffice it to say that many a collector has been upset to buy a pen only to find that another nib is not compatible. The Merz & Krell nibs had a different collar entirely and cannot receive any other nibs nor can their nibs be used with other non-Merz & Krell pens. It is certainly something to be aware of and watched for closely if buying one of these models on the used market. Much less needs to be said about the feed. The vintage nibs can be identified by their ebonite design with longitudinal fins. This is a very good system and provides a great writing experience with delivery of generous ink flow and a fair resistance against drying out. The problem with the ebonite is that it becomes fragile over time and needs to be handled gently. I never remove an ebonite feed lightly due to the risk of breaking one of the longitudinal fins. It certainly can be done but care must be taken. When new, Pelikan themselves had a special tool for removal as described above which should be reason enough to respect their delicate nature. That tool can be seen depicted here on Martin Lehmann’s site. Today’s feeds on the Souverän and Tradition series pens are made of modern plastic and have horizontal fins but still deliver generous ink flow. These are much more durable and can be exchanged with relatively little worry for damage. There is a tool that was sold with the calligraphy sets (MC110 & MC120) which can be used for unscrewing M1xx – M4xx nibs but this is not necessary. Finally, many of Pelikan’s lower tiered pens have various feed designs made from solid plastic, lacking the fins seen on the higher end models. The nib has had some design changes over time but generally has retained its basic shape. The materials used have varied depending on the model. Gold is prevalent with 14K and 18K nibs being the most common on the upper tier models but 12K nibs are known to exist as well. Many of the special edition pens will have rhodium plating as well. 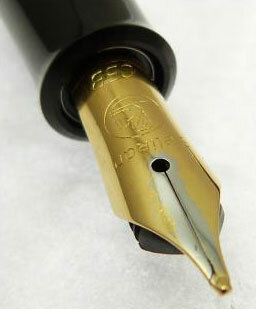 The older gold nibs are usually monotone in color while the more recent nibs have a two-tone finish. The Tradition series uses nibs that are stainless steel in design with gold plating. The plating can flake off with use, revealing the base metal. During war-time, palladium and chrome nickel steel was used when other metals were scarce and these nibs can be identified by their ‘Pd’ and ‘CN’ imprints. The tipping material of the nibs has also changed in character. 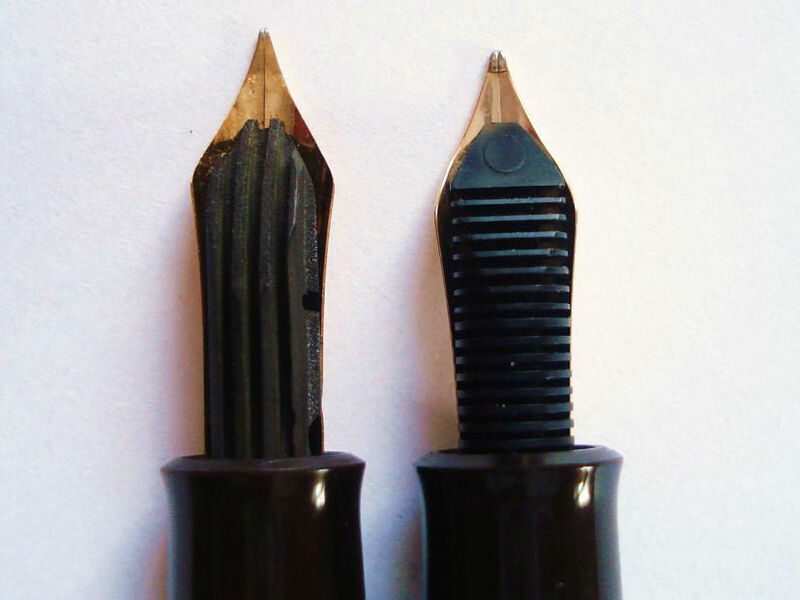 Older nibs, those produced prior to the mid-1990’s, had a flatter tipping material which seemed to impart more character to the nib and the strokes produced by it. This is often much preferred to today’s ball-like tipping material which is designed for more general use in order to cut down on end-user frustration from the non-hobbyist. In addition to the tipping, the flexibility of nibs has changed. Many people seek out older nibs for their flex or semi-flex properties because these can be taken advantage of to produce beautiful script. Over-flexing though can cause damage and result in a sprung nib which is often beyond rehab or even induce stress cracks in the metal. Again, in order to reduce failures from pens in the hands of the modern, average user, Pelikan has made today’s nibs firm, with little to no flex. While gold is often lauded for its ability to spring more and have a softer feel than stainless steel due to the softer nature of the metal, there is a strong belief (myself included) that the older stainless steel M2xx nibs are quite springy and a joy to write with. One interesting feature of the nibs is the number and shape of the breather holes over time. On the early model 100’s circa 1929, the breather hole was heart-shaped. These nibs were produced by Montblanc for Pelikan and are highly desirable and valuable in today’s market. 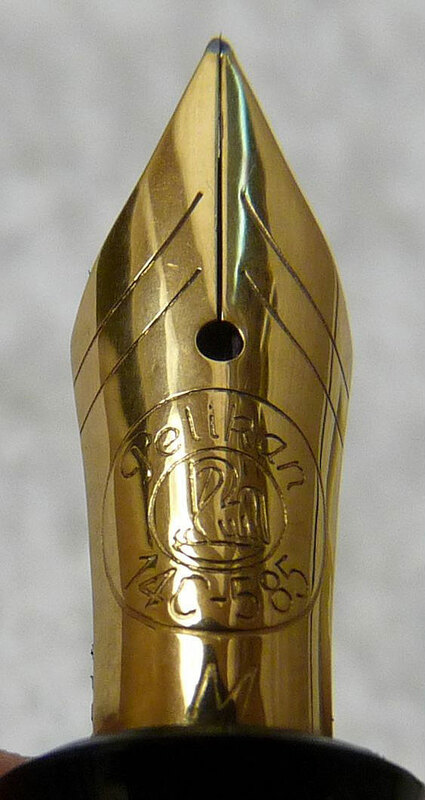 After Pelikan assumed the production of their own nibs, the breather hole became round. Some nibs will have two breather holes visible and this is indicative of an extra firm manifold nib for writing on carbon copies. Finally, in addition to the breather hole some nibs will have an additional hole at the base of the nib, often obscured by the collar. These are seen on pens like the 400 and the 140 and generally have no significance. Pelikan has had many nib imprints/engravings over the years, more than I could possibly detail here. Vintage pens will have ‘Pelikan’ written across the nib either in a single line or parallel lines. Below that was usually the designation of the gold content of the nib (or other metal). These are known as script nibs and were included on Pelikan pens until around 1954. 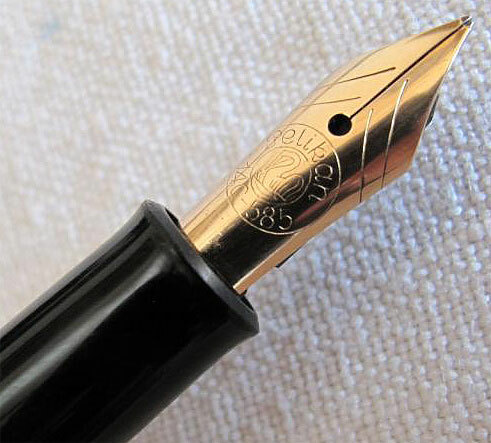 At the end of 1954, the logo nib was introduced which has included the company’s logo circumscribed by the company’s name and gold content of the nib. For a nice pictorial of many of the different variations, see this page hosted by Werner Rüttinger. Will the screw in m400 model nibs fit into the friction fit m400 bodies? Friction fit bodies lack the threads for a collar I believe so, no, a screw-in M400 nib would not fit a friction fit body to the best of my knowledge. I think I may have made a big mistake. I purchased a cafe creme from pensinasia\Aesthetic Bay via eBay. I inquired if I could get it with a Broad nib and they said yes, they’d put one on it. It arrived today. The nib has 2 chicks. So it is apparently not a new nib. What year did they stop making the 2 chick nibs? Should I be concerned and return it? Thanks! I don’t see a mistake from what you describe, none at all. The Café Crème is a most awesome pen. The nib may be one of the older ones from what you describe. The two chick logo was done away with in 2003. Pelikan has continued to use up old stock on their nib in that time. I have seen two chick nibs persist as late as 2015 but they seem to have largely been phased out in the last few years. My Café Crème which was bought new at the time of release also has a two chick nib. Despite the older logo, they are literally otherwise identical to the more recent one chick logo nibs. This is not something that I would worry about at all. Enjoy your pen with it’s broad nib and don’t give it a second thought. Just my 2 cents. Thank you Joshua. I also want to thank you for sharing all of your knowledge on your outstanding website. You’re most welcome and thank you for the kind words about my site.